Thank you all!! I really appreciate all the kind words! Drinking coffee above Lake Wanaka, New Zealand on a chilly December morning. 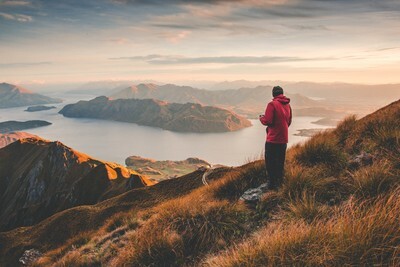 This photo was taken on top of the iconic Roys Peak 4000 ft above Lake Wanaka, New Zealand. After spending the night in just sleeping bags tucked between the tussock grass we woke up to this magnificent sunrise. Most beautiful landscapes are taken at the edges of the day, this one is no exception. The subject, a close friend of mine, had his coffee in hand, steaming in the crisp morning air, while he stood quietly - admiring the vast views of endless ranges of mountains and only breaking the silence with sips from his coffee mug. Soft morning light, is the best kind of light. I exposed for the highlights because I wanted to capture dark contrast with a gritty look, while keeping the sky from blowing out the details. Canon 5D Mark iii with a 24-70mm f/4 IS lens. The camera was hand held. There is something very charming about capturing your friends while on adventures and being able to share that with them days, weeks, or perhaps even months after to serve as a reminder of something fun that you did together. In turn, they may share this photo with others, who may one day find themselves sitting on top of Roys Peak with a coffee in hand on a brisk morning because of the subjects story. I try to never make my photos look fake with editing - let's start there. In this particular photo I wanted a gritty/ harsh look but didn't want the saturation to get blown out. As mentioned above, I exposed for the high lights to deep details in the sky. I added contrast, brought to life the shadows, and then flattened the blacks. Since my adventures usually take me to far off places in the world I try to never carry more than my camera and maximum two lenses and a tripod. I really like zoom lenses for their versatility but I opt for lenses without IS to keep weight down. Depending on what I'm trying to achieve, I'm probably carrying the 24-70mm that's attached to my canon. This is actually a very simple shot, and it takes very little to achieve. 1. Expose for the sky - find where the highlights are clipping and dial the light meter back again. Timing is everything. But then again so are close friendships, sponteneity and waking up with the sun. Try to do something different by shooting into the sun rather than having it at your back. Your shots look more interesting and create a stronger feeling of "being there".